Dot Matrix Scroller bought from Greenweld. 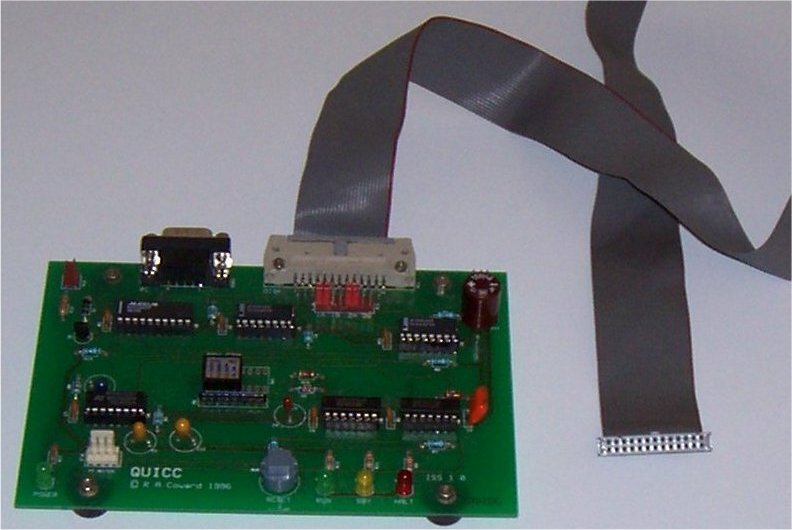 QUICC-IDM bare board, pre-programmed PIC (not copy protected) and all software/documents (E-mailed or on CD-ROM) - �25 including UK delivery. EDF (Enhanced Display fireware) - park of 3 EPROM's - �10 including UK delivery. The two items together - �30 including UK delivery. The power supply below is longer available. However Robert Coward's Data Sheet: Display Release 29-09-06.zip [1.42 MBytes] provides alternate types you can use, plus information about the whole display panel and interface system. See an extract from a Robert Coward E-mail at the bottom of this page for futher details of system. Display Front - 4-Line 8-Character 5x7 RED-GREEN-YELLOW LED's. �49 each from Display Electronics. 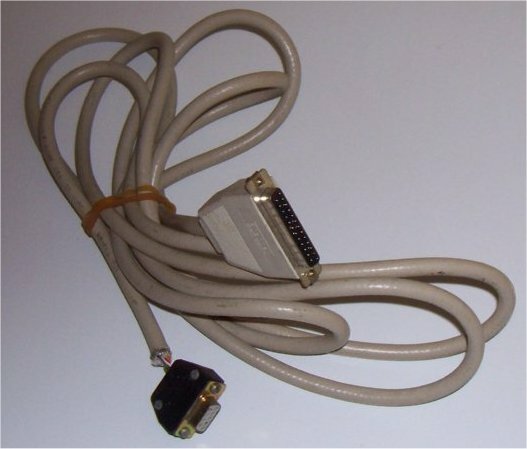 As early version of the RS232 to Display Interface uses QDSL Windows Software to programme the display. "Regarding the Power Supplies, I haven't got a definitive list, but I have clearly specified the requirements in the documentation. I don't think this will be a problem, as this project is aimed at more experienced constructors, anyway. Also, I don't want to prescribe a specific PSU, as I would then have to prove that the system works with it - something I don't want to do at present. Also, there were actually two power supplies, if you remember; your picture shows the logic PSU, but there is also the whopping big 8V PSU that came with the original system. I don't think Distel bought any PSUs from Greenweld, because there were none left. 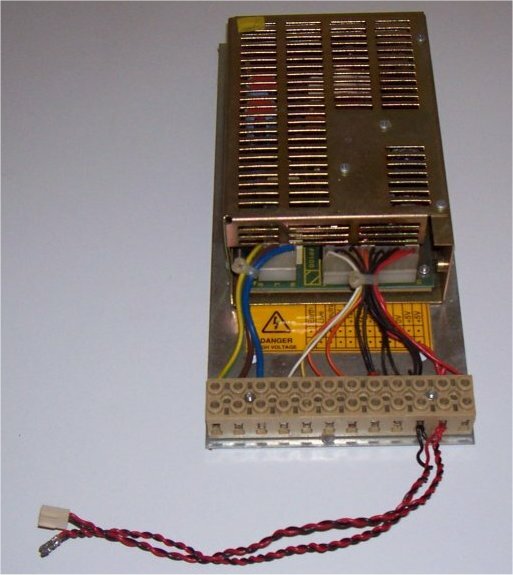 The original system consisted of 15 panel units, with one logic PSU and two 8V PSUs each. There were 60 systems in total, meaning 120 8V PSUs, 60 logic PSUs and 900 display panels. Therefore, as people have been building small systems with up to 3 panels, you can imagine that the PSUs will run out much faster than the panels." 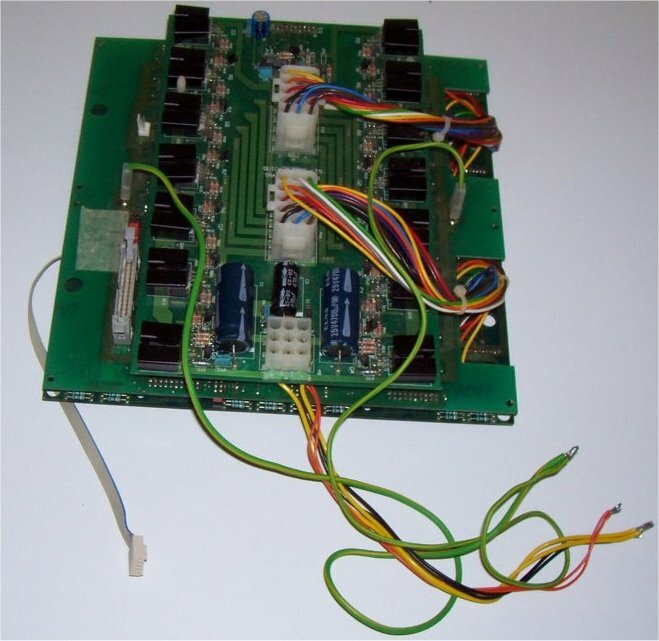 "Therefore, I have had a number of QUICC-IDM (QEDD9008 Universal Interface and Control Circuit - Intelligent Display Manager) control boards manufactured, so that I am in a position to supply them if people wish to build a complete system. 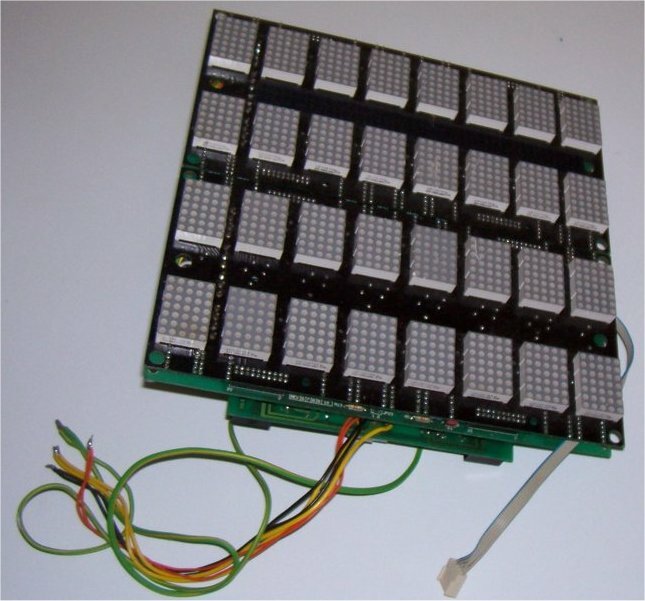 This board is a more advanced version of the QUICC board you already have, and provides power management and configuration/control/status reporting facilities. However, it does not store message data, and is still just an interface board to a PC. In 1998, only the PIC16C84 was available as a flash device, so I had to design a software UART (Universal Asyncronous Receiver/Transmitter) into it, using one timer, one interrupt and just 36 bytes of memory! This was quite a challenge at the time, but would be trivial these days with a PIC16F876 or PIC18F252 (and you could easily add display message memory as well).